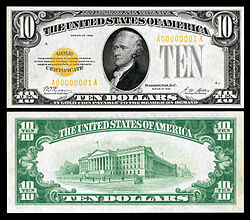 The United States ten-dollar bill ($10) is a denomination of U.S. currency. The obverse of the bill features the portrait of Alexander Hamilton, who served as the first U.S. Secretary of the Treasury. The reverse features the U.S. Treasury Building. All $10 bills issued today are Federal Reserve Notes. As of December 2013, the average life of a $10 bill is 4.5 years, or about 54 months, before it is replaced due to wear. Ten-dollar bills are delivered by Federal Reserve Banks in yellow straps. The source of the portrait on the $10 bill is John Trumbull's 1805 painting of Hamilton that belongs to the portrait collection of New York City Hall. The $10 bill is unique in that it is the only denomination in circulation in which the portrait faces to the left. It also features one of two non-presidents on currently issued U.S. bills, the other being Benjamin Franklin on the $100 bill. Hamilton is also the only person not born in the continental United States or British America (he was from the West Indies) currently depicted on U.S. paper currency; three others have been depicted in the past: Albert Gallatin, Switzerland ($500 1862/63 Legal Tender); George Meade, Spain ($1,000 1890/91 Treasury Note); and Robert Morris, England ($1,000 1862/63 Legal Tender; $10 1878/80 Silver Certificate). In 2015, the Treasury Secretary announced that the obverse portrait of Hamilton would be replaced by the portrait of an as-yet-undecided woman, starting in 2020. However, this decision was reversed in 2016 due to the surging popularity of Hamilton, a hit Broadway musical based on Hamilton's life. 1861: The first $10 bill was issued as a Demand Note with a small portrait of Abraham Lincoln on the left side of the obverse and an allegorical figure representing art on the right. 1862: The first $10 United States Note was issued with a face design similar to the 1861 Demand Note; the reverse, however, was somewhat revised. The Roman numeral "X" may represent the origin of the slang term "sawbuck" to mean a $10 bill. 1863: Interest Bearing Notes, featuring a portrait of Salmon P. Chase and vignette of liberty, were issued that could be redeemed one year after the date printed on the bill for $10 plus 5% interest. The notes could also be spent for exactly $10. 1864: Compound Interest Treasury Notes, with a face design similar to the 1863 Interest Bearing Note, were issued that grew in face value 6% compounded semi-annually. It is unknown if the note could actually be spent for $10 plus interest. 1869: A new $10 United States Note was issued with a portrait of Daniel Webster on the left and an allegorical representation of Pocahontas being presented to the Royal Court of England on the right side of the obverse. This note is nicknamed a "jackass note" because the eagle on the front looks like a donkey when the note is turned upside down. 1870: National Gold Bank Notes, featuring a vignette of Benjamin Franklin flying a kite on the left and liberty and an eagle on the right, were issued specifically for payment in gold coin by participating national banks. The back of the bill featured a vignette of U.S. gold coins. 1875: The 1869 United States Note was revised. The blue and green tinting that was present on the obverse was removed and the design on the reverse was completely changed. 1878: The first $10 silver certificate was issued with a portrait of Robert Morris on the left side of the obverse. The reverse, unlike any other federally issued note, was printed in black ink and featured the word SILVER in large block letters. 1879: Refunding Certificates were issued that paid 4% interest annually. 1886: A new $10 silver certificate with a portrait of Thomas A. Hendricks was issued. 1890: Ten-dollar Treasury or "Coin Notes" were issued and given for government purchases of silver bullion from the silver mining industry. The note featured a portrait of General Philip Sheridan. The reverse featured an ornate design that took up almost the entire note. 1891: The reverse of the 1890 Treasury Note was redesigned because the treasury felt that it was too "busy" which would make it too easy to counterfeit. Series 1901 $10 Legal Tender depicting military explorers Meriwether Lewis, William Clark, and an American bison. 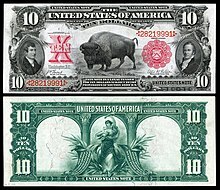 1901: The famous United States Note featuring portraits of Meriwether Lewis on the left, William Clark on the right, and an American bison which is sometimes erroneously noted as being Black Diamond, the Bison which was depicted on the reverse of the Indian Head Nickel. This United States Note was the only one to mention the legal provision that authorized its issuance. The reverse featured an allegorical figure representing Columbia between two Roman-styled pillars. 1907: Congress officially ended the interest paid on Refunding Certificates, forever making their face value $21.30. 1907: The first $10 gold certificate with a portrait of Michael Hillegas on the front and orange-colored back was issued. 1914: The first $10 Federal Reserve Note was issued with a portrait of Andrew Jackson on the obverse and vignettes of farming and industry on the reverse. The note initially had a red treasury seal and serial numbers; however, they were changed to blue. 1915: Federal Reserve Bank Notes (not to be confused with Federal Reserve Notes) were issued by 4 individual Federal Reserve banks. The obverse was similar to the 1914 Federal Reserve notes except for large wording in the middle of the bill and a portrait with no border on the left side of the bill. Each note was an obligation of the issuing bank and could only be redeemed at the corresponding bank. 1918: The 1915 Federal Reserve Bank Note was re-issued under series of 1918 by 4 Federal Reserve banks. 1923: The $10 United States Note was redesigned with a portrait of Andrew Jackson. Some of the design aspects of this note, such as the bottom border and numeral 10 overprinted with the word TEN, were transferred over to the series of 1928 $10 bill. The first 1953 $10 Silver Certificate printed (Smithsonian). 1929: Under the Series of 1928, all U.S. currency was changed to its current size. 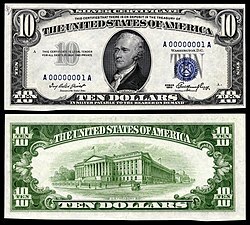 All variations of the $10 bill would carry the same portrait of Alexander Hamilton, same border design on the obverse, and the same reverse with a vignette of the U.S. Treasury building. The $10 bill was issued as a Federal Reserve Note with a green seal and serial numbers and as a gold certificate with a golden seal and serial numbers. The car parked outside of the Treasury Department building is based on a number of different cars manufactured at the time and was the creation of the Bureau designer who developed the artwork that served as a model for the engraving, because government agencies were prohibited from endorsing any specific manufacturer or product, according to a bureau of engraving and printing pamphlet. The tiny building to the right rear of the treasury building is the American Security and Trust Company Building, which for some years advertised itself as "right on the money". 1933: As an emergency response to the Great Depression, additional money was pumped into the American economy through Federal Reserve Bank Notes. This was the only small-sized $10 bill that had a different border design on the obverse. The serial numbers and seal on it were brown. 1933: The first small sized $10 silver certificates were issued with a blue seal and serial numbers. The obverse had a similar design style to the 1928 $1 Silver Certificates; however, phrasing on the $10 bill was different from the $1 bill. This issue, with the series date of 1933, was not widely released into general circulation. Surviving examples of these notes usually sell for $10,000 to $30,000 in the numismatic community depending on the condition of the paper. 1934: The redeemable in gold clause was removed from Federal Reserve Notes due to the U.S. withdrawing from the gold standard. 1934: The $10 Silver Certificate was redesigned with a blue numeral 10 on the left side of the obverse and the treasury seal printed over the gray word TEN on the right. Phrasing on the certificate was changed to reflect the Silver Purchase Act of 1934. 1942: Special World War II currency was issued. 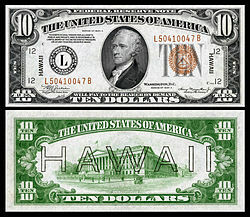 HAWAII was overprinted on the front and back of the $10 Federal Reserve Note, and the seal and serial numbers were changed to brown. This was done so that the currency could be declared worthless in case of Japanese invasion. A $10 Silver Certificate was printed with a yellow instead of blue treasury seal; these notes were given to U.S. troops in North Africa. These notes, too, could be declared worthless if seized by the enemy. 1950: Many minor aspects on the obverse of the $10 Federal Reserve Note were changed. Most noticeably, the treasury seal, gray word TEN, and the Federal Reserve Seal were made smaller, the words WASHINGTON, D.C. were added between them and the serial number; also, the Federal Reserve seal had spikes added around it. 1953: The $10 silver certificate had several design changes analogous to the 1950 Federal Reserve Note design changes; also, the blue numeral 10 on the left side of the bill was changed to gray. 1963: WILL PAY TO THE BEARER ON DEMAND was removed from the obverse and IN GOD WE TRUST was added to the reverse of the $10 Federal Reserve Notes. Also, the obligation was shortened to its current wording, THIS NOTE IS LEGAL TENDER FOR ALL DEBTS, PUBLIC AND PRIVATE. Also during this time, production of Silver Certificates ends. 1969: The $10 bill began using the new treasury seal with wording in English that simply says, "The Department of the Treasury," instead of Latin "THESAUR. AMER. SEPTENT. SIGIL.," "Seal of the Treasury of North America." 1981: During production of Series 1977A, a few star notes from the Richmond FRB were made on experimental Natick paper, in the only experimental note series not involving the $1 bill. 1992: The first modern anti-counterfeiting measures were introduced with microscopic printing around Hamilton's portrait and a plastic security strip on the left side of the bill. Even though the notes read Series 1990, the first bills were printed in July 1992. 1995: The first notes (for Series 1995) at the Western Currency Facility begin printing in November. May 24, 2000: To combat evolving counterfeiting, a new $10 bill was issued under series 1999 whose design was similar in style to the $100, $50, $20, and $5 bills that had all undergone previous design changes. The major changes were a revised portrait of Hamilton and a revised vignette of the U.S. Treasury building, now facing front. The plastic security strip reads "USA TEN" and now glows orange under a black light. Like the new $5, the bills were first printed in December 1999. March 2, 2006: In addition to design changes introduced in 2000, the obverse features red background images of the Statue of Liberty's torch, the phrase WE THE PEOPLE from the United States Constitution, a smaller metallic representation of the Statue of Liberty's torch, orange and yellow background color, a borderless portrait of Hamilton, and to the left of Hamilton small yellow 10s whose zeros form the EURion constellation. The reverse features small yellow EURion 10s and have the fine lines removed from around the vignette of the United States Treasury building. These notes were issued in series 2004A with Cabral-Snow signatures. The first notes were printed in July 2005. On June 17, 2015, Treasury Secretary Jack Lew announced that a woman's portrait would be featured on a redesigned ten-dollar bill by 2020. The Department of Treasury was seeking the public's input on who should appear on the new bill during the design phase. Removal of Hamilton was controversial. Many believed that Hamilton, as the first Secretary of the Treasury, should remain on U.S. Currency in some form, all the while acknowledging that U.S. Currency was long overdue to feature a female historical figure – names that had been raised included Eleanor Roosevelt, Harriet Tubman, Susan B. Anthony and Rosa Parks. This led to the Treasury Department stating that Hamilton would remain on the bill in some way. The $10 bill was chosen because it was scheduled for a regular security redesign, a years-long process. The redesigned ten-dollar bill will be the first U.S. note to incorporate tactile features to assist those with visual disabilities. On April 20, 2016, it was announced that Alexander Hamilton would remain the primary face on the $10 bill, due in part to the sudden popularity of the first Treasury Secretary after the success of the Broadway musical Hamilton. It was simultaneously announced that Harriet Tubman's likeness would appear on the $20 bill while Andrew Jackson would now appear on the reverse with the White House. The design for the reverse of the new $10 bill was set to feature the heroines of the Women's Suffrage Movement in the United States, including Susan B. Anthony, Alice Paul, Sojourner Truth, Elizabeth Cady Stanton, Lucretia Mott, and the participants of the 1913 Woman Suffrage Procession who marched in Washington D.C. in favor of full voting rights for American women. On August 31, 2017, Treasury Secretary Steven Mnuchin said that he would not commit to putting Tubman on the twenty-dollar bill, explaining "People have been on the bills for a long period of time. This is something we’ll consider; right now we have a lot more important issues to focus on." According to a Bureau of Engraving and Printing spokesperson, the next redesigned bill will be the ten-dollar bill, not set to be released into circulation until at least 2026. Because of this, it appears that a redesigned twenty-dollar bill featuring Tubman might not be released until years after the original 2020 release date. ^ U.S. Currency Education Program. "Weight of a US Banknote". uscurrency.gov. US Federal Reserve. Retrieved 19 January 2018. ^ "FRB: How long is the lifespan of U.S. paper money?". ^ "Secretary Lew Announces Historic Decision To Feature A Woman On The Newly Redesigned Ten Dollar Note" (Press release). U.S. Treasury Department. June 17, 2015. Retrieved June 18, 2015. ^ Morris, Chris. "The Harriet Tubman $20 Bill Plan Has Been Put on the Back Burner". Fortune. Fortune. Retrieved 4 December 2018. ^ "Currency NOTES" (PDF). Bureau of engraving and Printing. ^ "Trademark search details for "Right on the money"". Boliven. Archived from the original on July 8, 2011. Retrieved January 22, 2010. ^ "USPaperMoney.Info: Series 1990 $10". ^ "USPaperMoney.Info: Series 1999 $10". ^ "USPaperMoney.Info: Series 2004A $10". ^ Calmes, Jackie (June 17, 2015). "Woman's Portrait Will Appear on the $10 Bill". The New York Times. ^ "Woman 10 bill redesign update". CNN. 2016. ^ "Meaningful Access White Paper" (PDF). B of Engraving and Printing. 2013. ^ "Women Currency Harriet Tubman". The New York Times. 2016. ^ "The New $10 Note". US Department of the Treasury. 2016. Archived from the original on 2016-04-27. ^ Temple-West, Patrick (August 31, 2017). "Mnuchin dismisses question about putting Harriet Tubman on $20 bill". Politico. Retrieved 6 September 2017. ^ What Happened to the Plan to Put Harriet Tubman on the $20 Bill? Wilhite, Robert (1998). Standard Catalog of United States Paper Money (17th ed). Krause Pubns Inc. ISBN 0-87341-653-8. Hudgeons, Thomas (2005). The Official Blackbook Price Guide to U.S. Paper Money 2006, Edition #38. House of Collectibles. ISBN 1-4000-4845-1. Friedberg, Arthur; Ira Friedberg; David Bowers (2005). A Guide Book Of United States Paper Money: Complete Source for History, Grading, and Prices (Official Red Book). Whitman Publishing. ISBN 0-7948-1786-6.